If you have enjoyed eating Boletus edulis - A/K/A - King Bolete ( Cep in France, Steinpilz in Germany, Porcini in Italy ) then you will be very happy to become acquainted with these Two-colored Boletes. The stature is similar to the King Bolete and the composition, that is, the feeling of solidness, is also very similar. Many times you will find these growing in clusters, as shown by the three in the upper right portion of photo. Mostly though they will be scattered as single individuals. Often you will find these when the King Bolete is not to be seen. 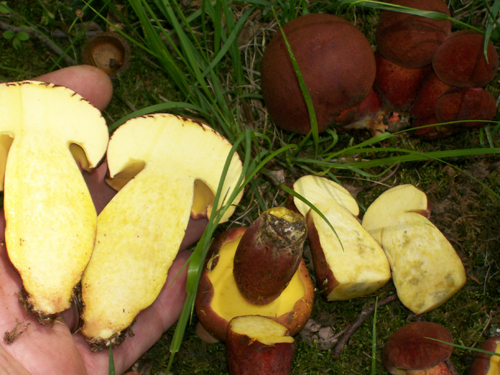 To say it another way, when the King bolete is growing somewhere but you can't find them these can be an alternative. 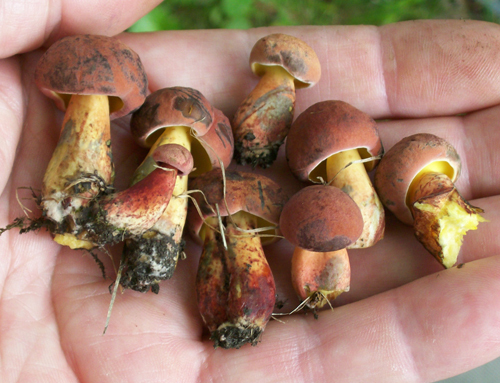 Many times I will find some of these and an occasional few King boletes also. 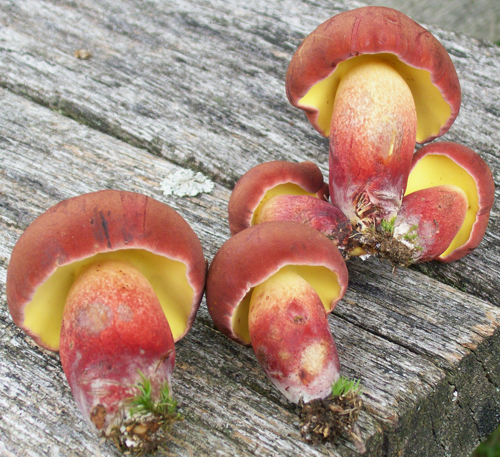 Also, these are not as bug infested as Boletus edulis usually is. 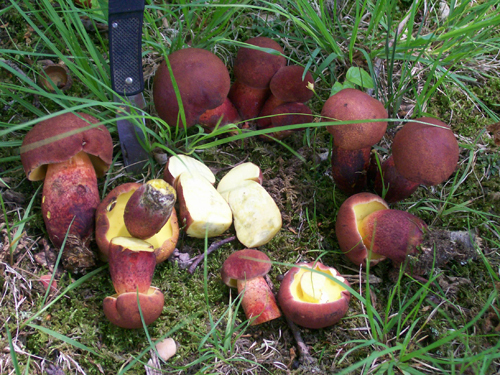 Oftentimes, with these two-colored boletes you will end up with the cap AND stem for eating. If you have picked as many mushrooms as I have you will also have spent a lot of time trimming King Boletus as you pick them to rid the parts infested with mushroom fly larvae. Here's a group photo which highlights the dark brick red, almost a maroon/burgundy cap color. You will find that color when the mushroom is young and prime. This is what they should look like when you wish to have them for eating. 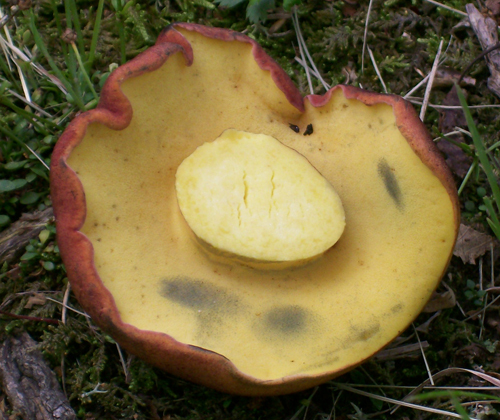 As the Two-colored Bolete gets more mature the cap color lightens up and eventually has more yellow in it. It can become sort of mottled with a redishness in a yellow background. Often, when the cap is a lighter color it will be at the stage where it is larva infested or soft fleshed, or both. Leave them be and let them enjoy their lives. They won't be good eating at this stage anyway. The pore surface is a very bright cadmium yellow. The pore surface will bruise to Payne's gray ( bluish-gray ) where handled. The flesh, in the cap and in the stem, WILL NOT turn blue, or if it does, it will do so ever so slowly. This feature of NOT instantly turning blue is important to recognize because it is one of the distinguishing characteristics to help in identification. 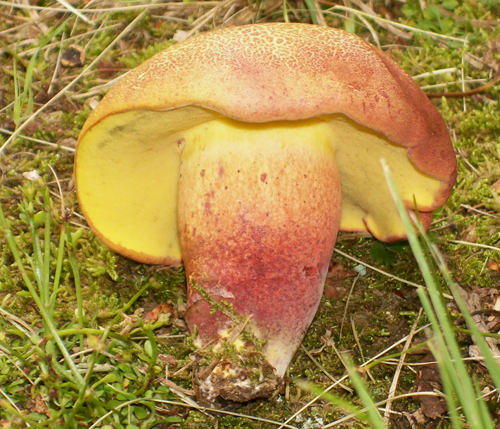 A similar looking bolete that blues instantly is a species that can make you sick. 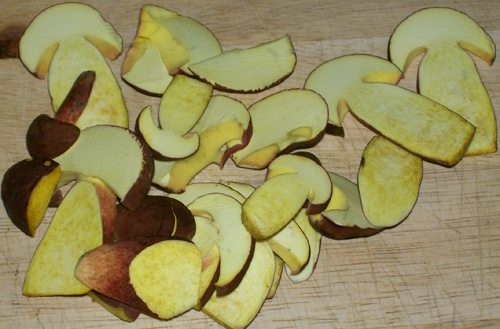 Here is a good example of the non-changing color in a bunch of Two-colored Boletes which have been sliced up for my evening supper. Notice that the bright yellow color is consistent in all slices. The photo below illustrates the bicolor nature of the stem and the stem's physical structure. You can notice that generally the stems are robust/stout, that the lower portion is darker in the redness scale and the upper portion getting yellowish. As the mushroom matures and the cap starts to become less red and more mottled with red and yellow mix ( see above 3rd photo ) the stem also starts to lose some of that color differentiation. A stem with it's lower portion pretty much the same color aspect as the cap surface. The non changing to blue when the FLESH of the cap or stem is cut. The pore surface is bright yellow. And even in fully grown specimens the pores are thin. Growth habit is usually around oak trees. Another best practice is to pick only the best specimens in the area. Leave the soft fleshed, lighter colored caps behind. A real treat for the table is to get the babies, that is, the button-like small ones and keep them separate to serve for special occasions or dishes. No need to cut, they are really great in a good stew or spaghetti sauce. These are a fine tasting mushroom, and if not allergic to them, a fine addition to your list of edibles to pick every year. I enjoy them as much as Boletus edulis. You can't mess up a saute because they have less moisture in them when picked in their prime therefore when cooking a large bunch it won't turn into a boil as with some other types of mushrooms. The texture is also similar to the King and has a very good flavor. As with any new addition to your list of mushroom pickables try only a small portion the first few times. DATE - June 21, 2009. FOUND - Laurel Hill State Park, Bakersville, Pa. area and St. Boniface Church ( near Stahlstown ) picnic area. Several clusters and many individuals were found in both locations. Both locations are open spaces, mossy and have white oak and/or chestnut oak trees. Weather conditions: Hot and humid. Rain the day before. Some rain for a few days the week before. Mostly the weather has mostly hot and humid.